The Honeywell Dolphin 9700hc ensures for high productivity and perfect performance in clinical environments. It guarantees mobile real-time access to patient files, test results, laboratory values, medication availability and much more. The integrated 802.11 a/b/g Wi-Fi supplies secure and reliable communication. Via Bluetooth you may also easily control peripheral devices, such as a printer. Its housing features a plastic surface capable of withstanding daily harsh disinfectant cleanings. 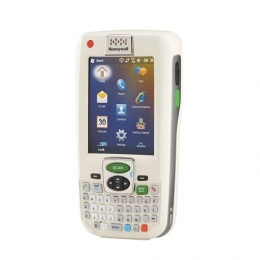 An integrated ergonomically angled barcode imager provides fast, reliable capturing of all 1D and 2D barcodes from files, medication, samples and monitors. Various available variants standard range, smart focus, high density guarantee precise performance in every area. You may additionally choose between a numeric and alphanumeric keypad.